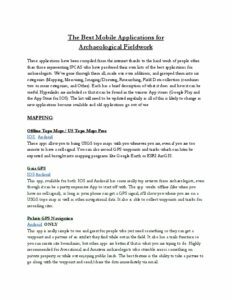 These apps allow you to bring USGS topo maps with you wherever you are, even if you are too remote to have a cell signal. You can also record GPS waypoints and tracks which can later be exported and brought into mapping programs like Google Earth or ESRI ArcGIS. This app, available for both IOS and Android has some really top reviews from archaeologists, even though it can be a pretty expensive App to start off with. The app works offline (like when you have no cell signal), as long as your phone can get a GPS signal, it’ll show you where you are on a USGS topo map as well as other navigational data. It also is able to collect waypoints and tracks for recording sites. This app is really simple to use and great for people who just need something so they can get a waypoint and a picture of an artifact they find while out in the field. It also has a trails function so you can create site boundaries, but other apps are better if that is what you are trying to do. Highly recommended for Avocational and Amateur archaeologists who stumble across something on private property or while out enjoying public lands. The best feature is the ability to take a picture to go along with the waypoint and send/share the data immediately via email. This app gives you the ability to call up a historic map while out in the field. As a consequence the is is both fun and practical while doing fieldwork, and can even just be interesting while being a tourist somewhere. Theodolite is an augmented reality overlay app that displays real time GPS, compass, azimuth, bearing, range, and inclination right over the camera input for your device. You can also save geotagged camera images directly from the app. There is also an optional add-in datum pack for an extra purchase which includes such widely used datums as NAD-27 and NAD-83. This App is supposed to be very similar to the Theodolite app in IOS. Just like Theodolite, the app will let you take photos with Geo-coordinates and angles in the photo. This is an app that supports layers, multiple pens/pencils, etc. And it has a feature I love: Trace. Just import or take a photo (from the app) and trace it. You can also import a photo, create a sketch layer, and insert text, lines, etc. Great for delineating a stratigraphic sequence, measurements, labels, etc. for a photo to go in a site recording or a report. You can save the result to .jpg, .png, or .bmp. Geometric shapes can be added and there is a “pen only” mode so you don’t accidentally draw with your palm or another finger. Great on a phone, even greater on a tablet. This App is essentially Adobe’s version of the Artecture Draw, Sketch, Paint App, and is available on both IOS and Android. It can be a little difficult to draw on the images while using your phone and probably works better on a tablet. It is still a very useful application and well worth giving it a try. This App is an essential app for anyone who does archaeology and has the potential to come across rock art. Though it really works best with pictographs (rather than petroglyphs), it still enhances the color difference in the rock and can bring out/highlight rock art that is invisible (or nearly invisible) to the naked eye (or on a photograph). It also can highlight superimposition and differences in pigments (possibly even chronology) that would otherwise be impossible to identify. Certainly a must have. The app is pretty expensive, but well worth it. Eight enhancements are included to cover all the pigments commonly seen at rock art sites. Several of the enhancements are specifically for red pigments, by far the most common pigment found at rock art sites. To use the app just load an image, either from your album or using the camera. Then just hit the *Enh* button to cycle through the enhancements. The available enhancements are: CRGB (for reds), YDT (general purpose), YRD (for reds), YBK (for blacks), YRE (for reds), YYE (for yellows), YWE (for whites), and RGB0 (for reds). If you use the camera then DStretch automatically saves the original image for you. You do not need wi-fi or a phone connection for this app. There is a settings page that allows you to change the scale (strength) of the enhancement, change the saturation (i.e. make it grayscale), change which enhancements are used, and reset the image. The desktop/website version is free but a $50.00 donation is recommended for professionals. Check out the page here. I’ve put in several mobile applications which can do photogrammetry, as well as some links to how to do photogrammetry without a mobile app, most of it is for free. These are more complicated processes, but it is still worth checking out. If you are interested in doing some photogrammetry, read the photogrammetry guides on the IPCAS website, and test it out a few times, make a few models, and see how you do. This application is designed for creating 3D Photogrammetry models from your phone as a mobile application. Only really available on IOS. The app will initiate a burst mode that automatically takes a maximum of 70 photos while your path around the object is being tracked. This greatly speeds up the capturing process. Trnio does allow loading existing photos from your iPhone’s Camera Roll. You can even send an upload link from the app to your email address. This creates a new project in the app and allows you to upload photos to that project from your computer. That feature is still Beta though and only accepts photos (80 max) in a .TAR file, which is a kind of .ZIP-file for servers that requires special compression software. After capturing, downscaled versions of your photos are uploaded to the cloud and processed. The app features an ingenious cropping feature that allows you to select which parts you want to keep by making a selection from the top and side view of the model. That doesn’t give you total cropping freedom, but works pretty fast. Unfortunately, the model has to be re-processed in the cloud to be cropped. If you like the model you can also choose to upload the full resolution photos for better textures. The model has to be reprocessed for this, but the result is worth it. The Trnio app itself is also a kind of social network. It allows others to follow you and like your work. You can make a profile similar to Instagram, but somehow my own captures don’t show up on my profile page. Like Instagram in its early days, you can’t share a link to your capture on other social networks directly. You can, however, export your capture to the online 3D showcasing website Sketchfab. Trnio is currently iPhone-only, but an Android version anticipated sometime in the future. This Android-only app developed by SmartMobileVision doesn’t feature any social features yet, or even an account registration system. But after logging in with a temporary username, it does have features that make it different than other Mobile Photogrammetry apps. The most important one is that it doesn’t do cloud computing but instead does all calculations locally on your phone. While the speed of this greatly depends on your phone’s processor, and naturally drains the battery. The upside is that you don’t have have to upload and download anything while making captures on the go. Both the 3D Model and the Photos you took are stored locally under “My Models”. You can also import image sets here, but they have to be numbered a certain way (name001, name002) and be a complete sequence. From here you can (re)start the processing of an image set. One other thing that sets Scann3D apart is that it offers fine control over the capturing and processing quality. There are Low, Medium, High and very High Presets, but you can also enter Advanced Mode to enter custom settings. The Image Size is capped at 1920 x 1080 pixels, anything larger is probably unrealistic for phone-based local processing. You can export the 3D model as .STL, .PLY or .OBJ file directly from the app. It saves it to a dedicated SCANN3D folder on the local storage of your phone. This way you can either send it to yourself through email or upload it to your favorite cloud storage, like Dropbox. Just remember that on newer versions of Android, you have to turn on “view local storage” from the 3-dot menu in the left corner of the file browser. Scann3D can also share directly to Sketchfab. In short, you will make the photos with a regular Android photo app and upload them to Autodesk ReCap 360 through its web interface. The free version only allows the “Preview” quality, but this is already great for most purposes and better than the two apps above. And if you rather use your computer, there’s also a free version of the ReMake desktop software for Windows (Review) that uses the same engine and offers many more features. This blog tutorial is just an amazing, straightforward guide to doing photogrammetry using a regular camera (or smartphone) and using free, online software to make good models. It is geared towards people who have little to no experience at this, and definitely worth reading and giving a try. This blog, from Sketchfab, is a really good guide to setting up your project if you want to use photogrammetry. I also recommend listening to the podcasts on the Archaeology Podcast Network on photogrammetry, so that you know as much as you can before you start. These three sites are sites for professional/industry standard software packages which produce 3D models from photogrammetry. If you get really into doing this, it might be worth investing in some good software, taking some good course on it, and truly dedicating yourself to making some amazing model. This is blog tutorial on how to create 3D photogrammetric scans using video shot on a smartphone or camera. It is a great guide, tells you all you need to know about which software to use and how to do it. Definitely check it out, give it a try, and see if you can make it work for you doing archaeology. This blog reviews a bunch of different 3D scanners, so if you are interested in scanning artifacts and making 3D models of them, definitely worth checking out this blog on what kind of equipment is out there and how to use it to make some amazing models that can be reproduced for research purposes. These two apps are essentially a pocket-sized Munsell book for your mobile device. You can generate color names, RGB and CMYK color conversions for your Munsell data, what I’d like to see is some way to have a standard lighting setting set by your phone/camera to then determine the color and have it all work. The actual Munsell book is much more accurate, but this at least gives you a much more inexpensive way to have the general colors available for reference while in the field. The SoilWeb app references your current location against USDA’s Natural Resource Conservation Service’s “Web Soil Survey” data to generate an average soil profile you can expect to encounter in your current location. You can also click on the series name for a complete soil taxonomy. The online Web Soil Survey is a great resource for archaeologists, the App is sure to be great in the field. With live view, clearly laid out data visualizations, dynamic compass view, weather forecasts, and a shadow calculator, among other features, this app is packed with useful features without going overboard and introducing clutter. Sun Seeker puts heavy emphasis on its 3D augmented reality view–otherwise known as live view–that overlaps sun, moon, and other celestial body paths over the view through your phone’s camera so you can see exactly what will be where, when. It also provides all manner of other related data tables. My only quibble with this app–and it’s a minor one–is that it’s interface isn’t as clean and clear as it could be. Otherwise, it’s a good alternative to Sun Seeker of you want live view but prefer your apps to have a more focused purpose. Sun Surveyor is another App with an augmented reality overlays, but this one does a really good job of it. Its interface puts emphasis on visualization rather than raw data. One unique feature of Sun Surveyor’s live view is that not only does it offer the option to make use of your phone’s camera, but you can also see the overlays over Google’s Street View for other locations. So you’re not limited only to using it from where you’re currently standing but can also plan ahead to where you plan to be. PhotoPills is really aimed at photographers, and as a bunch of other features useful to photographers like timelapse interval tables, depth of field calculator, and star trails simulator, but has so many features that could also be used by an archaeoastronomer. Like the others, it has sun and moon calculators along with live view/augmented reality. The Archaeology Sample Collector allows you to track and document your field work incorporating images, video, audio recordings, and/or text. It also allows you to track (with GPS) your path and enables the data to be synchronized to our website, edit, and/or share your work with others.You can also allow colleagues to view your work during or after your field trip by sharing it through your website, social networks, e-mail, etc. Once the collecting is uploaded to your website, you can edit the data, create reports and/or maps, and download the data or reports to spreadsheets or other documents. (You do not need to have access to the internet to run the application). Once your collecting is completed, you can automatically create a powerpoint or video of the sampling. It’s not all about data collection when you’re in the field or traveling! Podcast republic is a fantastic podcast app and the author is very active with updating it. There’s Chromecast support, you can sort by episodes, download order, subscription, etc. You can listen to everything on the Archaeology Podcast Network through this app as well as other podcasts you might be interested in..